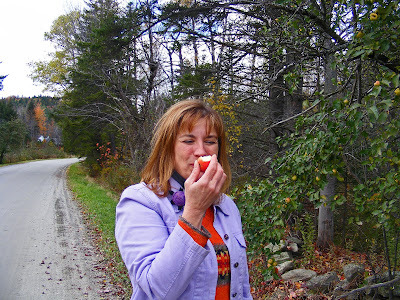 For Columbus Day weekend, I went to visit my parents in Vermont with one mission in mind – apple picking! The Kitchen Genius and our daughter Julie both had to work, so it was just Tommy, Little Miss Sadie Beans (who traveled quite well in her crate), and me. You can pick apples at orchards all over Vermont, but I was in full foraging mode by that point and while we were driving around looking at the gorgeous foliage, I saw some trees just loaded with wild apples. Now why would I pay for apples when they were there for the taking for free? As soon as we got home from our drive, I grabbed my step-father’s apple picker out of the woodshed and my Mom and I headed right back out. On a deserted road with no houses in sight, we found a tree with red apples and one with yellow apples almost side by side. I sampled both and decided the red ones had a lot more flavor. It only took a few minutes to fill my bushel basket. 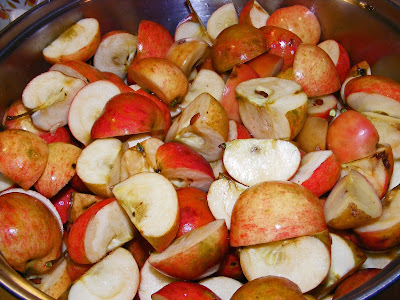 The apples were too small to spend the time peeling and coring them, but they were fine for apple jelly because you strain the seeds and skins. I quartered them up and into the pot they went. 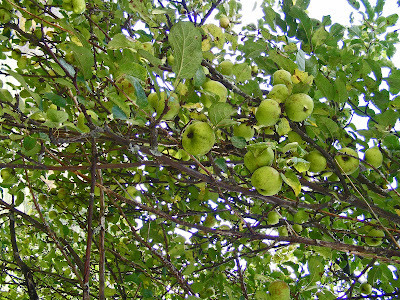 After I cooked them down, I still didn’t have enough juice to make a batch of jelly, but I noticed another apple tree just down the road. It was on a steep hill so it wasn’t easy picking. 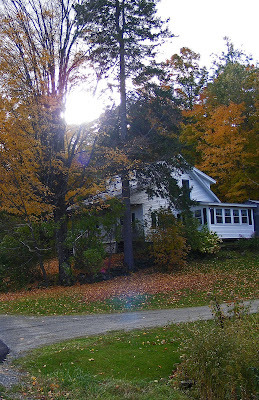 Luckily my parent’s neighbor Ken Grimm saw what I was trying to do and came over to tell me I was free to pick as many apples as I wanted on his beautiful property. Even little Sadie got into the action. She found an apple in my parents’ yard from one of their trees. 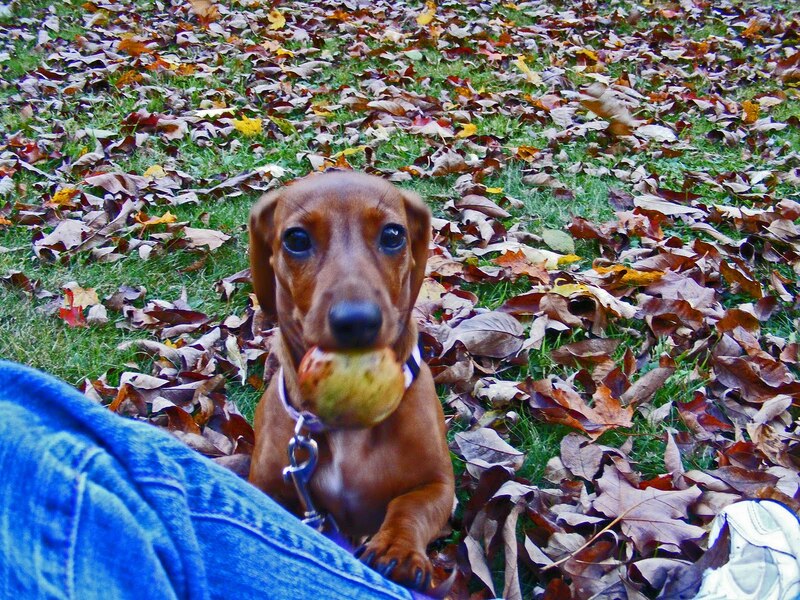 At first she thought it was a ball…but then she realized it was FOOD. Yep, she loved the apple. On the way home Tommy and I stopped at Alyson’s Orchard in Walpole, New Hampshire where they have 50 acres of orchards and grow every variety of apples I’ve ever heard of, and then some. 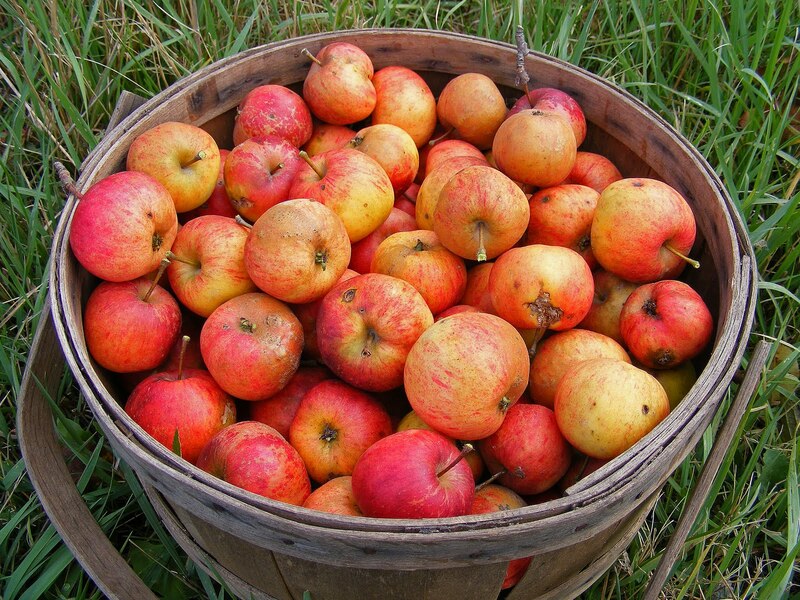 I bought a bushel bag of enormous Cortland apples (because you can never have enough apples). By the time I was finished with all those apples, I had canned applesauce, apple jelly and apple pie jam (which tastes just like apple pie filling and is a new family favorite). I also made two pies and a loaf of Oatmeal Apple Bread from a recipe my dear friend Jennifer shared with me. It took about 10 minutes to throw all the ingredients in my bread machine and this bread is simply heavenly. It’s even better the next day as toast slathered with some of the apple pie jam. It's so good, I’ve made it three times already. 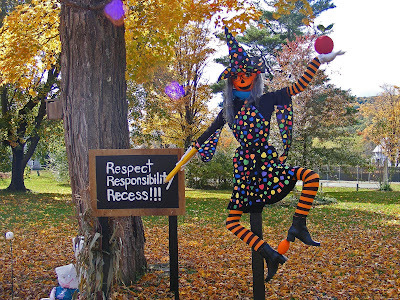 This scarecrow photo is for Jennifer in thanks for such a fabulous recipe. 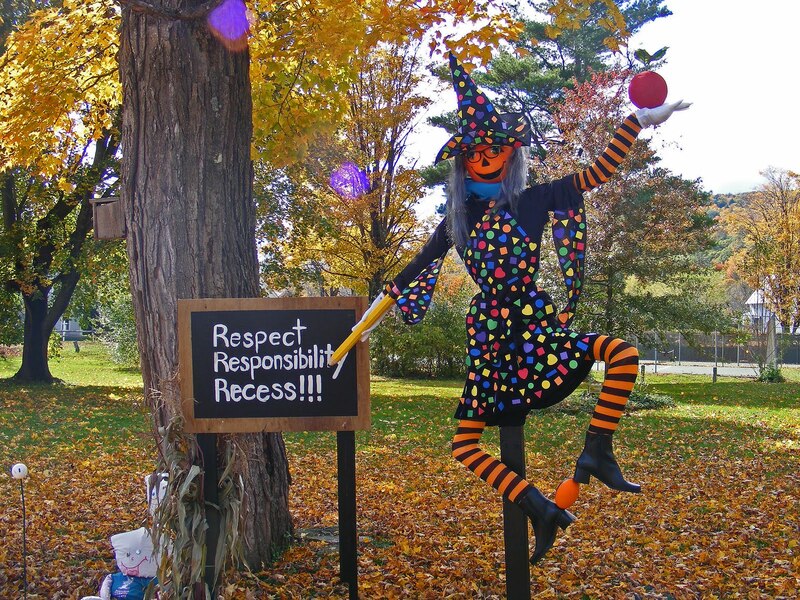 Check out the apple in her hand! Put all ingredients into bread machine and set for basic bread, large loaf. Yes, it's that simple. Combine apples, lemon juice, butter and pectin in a large Dutch oven pan. Bring to a full boil, then add sugar and cinnamon. Return to a boil and boil hard for 1 1/2 minutes (Mississippi one, Mississippi two…), stirring constantly. Skim off foam and pour into hot, sterilized jars, filling to within 1/8 inch of tops. Wipe rims with clean, damp paper towel and cover with lid and screw band. Process in hot water bath for 10 minutes. 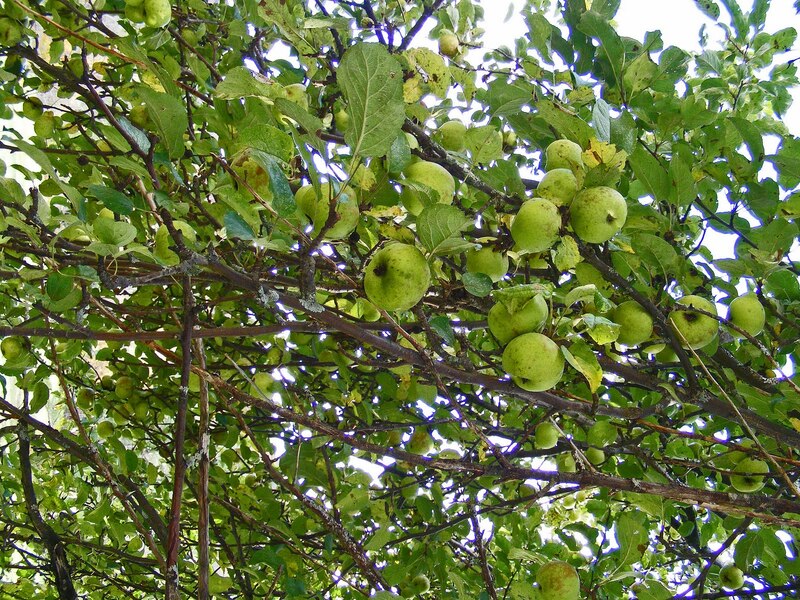 I love how bountiful those apples trees were, and how beautifully the branches were weighed down by all that fruit. I haven't been to Vermont, but I hear it is absolutely gorgeous. 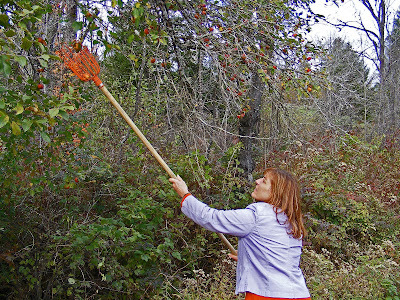 I'm impressed with all of those wild apples. As one who's tried that apple pie jam, I know how good it is. Sounds like a delicious loaf!!! Such gorgeous apples and beautiful pictures. What a fun day, so nice to have such an abundance of apples! Love the bread, I will have to try it sometime when I have cider on hand. Laurie, both of these recipes are definitely keepers. I have not ever heard of Apple Pie Jam, but love the creative flavors. How fun. I have never been to Vermont and would love to go this time of year! Beautiful bread too! I love the sound of the jam! Isn't it funny how dogs like apples? And strawberries. I know I would love this bread. 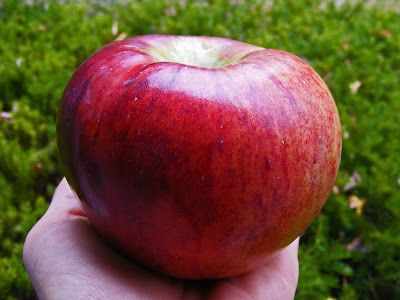 how fun to pick apples, I've never doen that before. 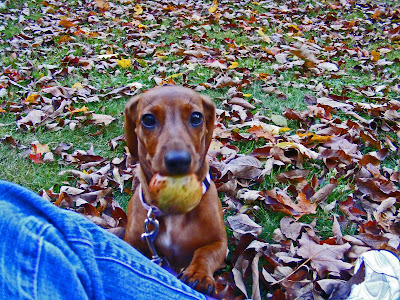 The picture of the pup with the apple in it's mouth is priceless!! Laurie, hope you're not too snowed in! For some reason today, I decided to click on the "next blog" link on my blog. 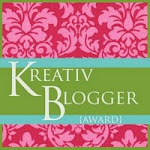 Not knowing what awaited at the next blog, I was so pleasantly surprised to find your blog!! 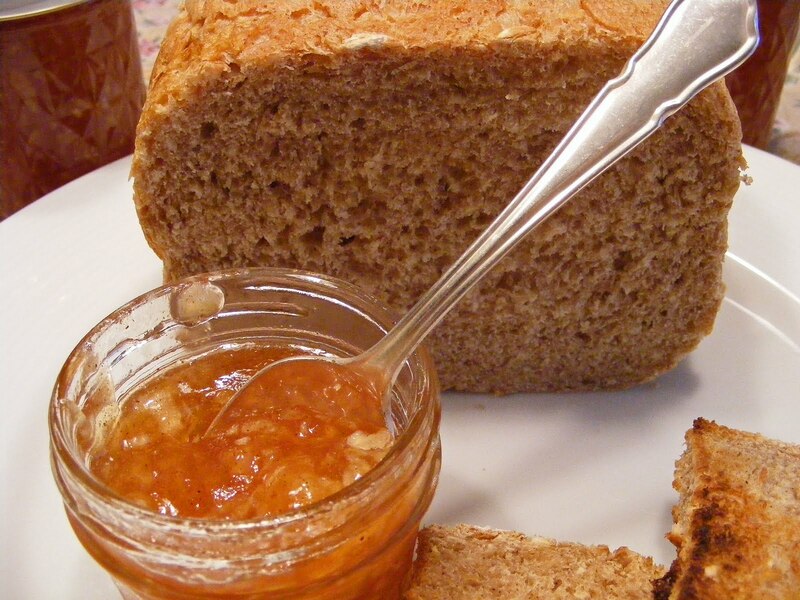 Love your post & pics about the bread & jam. While I can't eat the bread (have celiac), I can definitely make & eat the jam. It's snowing here in Dallas and I can't wait for the yummy smell to waft through the house, making it an absolute delight to be snow-bound. Thanks for sharing!! So MUCH FUN!!! 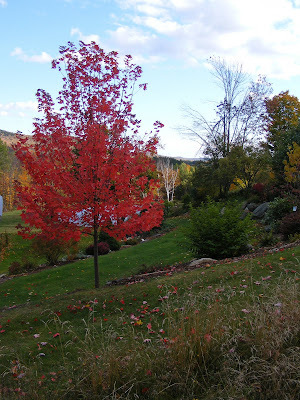 I love Vermont, obviously and cannot wait to go apple picking (and blueberry picking) this year!